Despite its enviable status as Nigeria’s commercial hub and mega-city with over 20 million population, many residents of Lagos continue to live in unplanned, informal settlements where security of tenure is often lacking. High rental costs, compounded by lack of access to land and housing push residents to seek shelter in these areas where living conditions are squalid. As a result, these settlements are often targets of the state’s urban renewal program where the government often uses force to evict predominantly low-income and very poor occupants, with devastating consequences. How can residents of informal settlements and communities access affordable housing through the formal channels of housing delivery? Where can they access information about the state’s processes and procedures for land and housing allocation? This was the central theme of a one-day policy dialogue that Spaces for Change | S4C organized in collaboration with the Communities Alliance Against Displacement | CAD on February 22, 2018. Prior to the meeting, S4C had asked Lagos State authorities to unveil its housing agenda for Lagos informal communities. 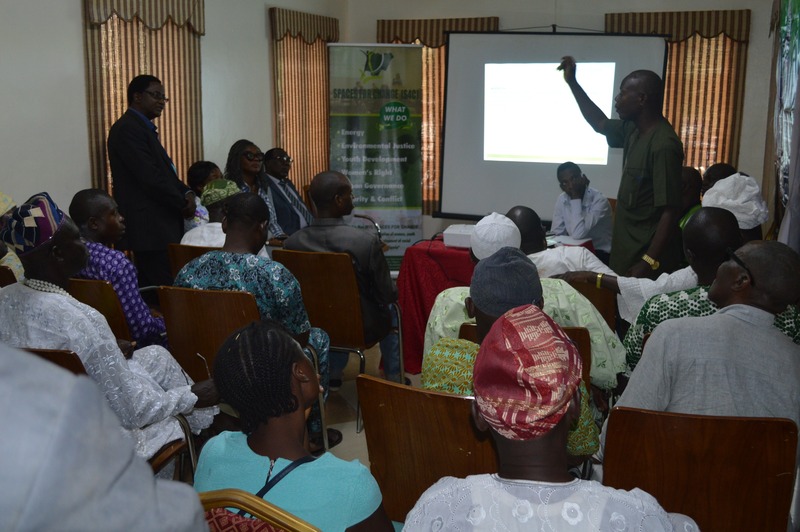 The workshop brought together 40 participants comprising senior officials of the Lagos State Ministries of Housing and Information together with the leaders and residents of 23 informal communities across Lagos State. The informal communities are members of CAD. Residents of informal communities lack adequate information about Lagos State’s housing policies and programs, and therefore, hardly benefit from them. The dialogue, ‘Unveiling the State’s Housing Agenda for Lagos Informal Communities’, afforded an opportunity for participants to debate and interrogate urban policy, learn about challenges in the implementation of urban policy and mutually explore solutions for urban reform. In her opening remarks, S4C’s executive director, Victoria Ohaeri stated that the meeting represents a strategy shift from the organization’s tradition of street campaigns, litigation, and policy confrontation around issues of forced evictions and demolitions in the state. Because of the high influx of businesses and migrants to the city of Lagos, developmental expansion will remain inevitable. As such, it is important that citizens are informed about Lagos housing policies so as to enable citizens to understand their statutory rights, claim them and challenge any governmental interference with those rights. Mrs Olayinka Patunola – Ajayi (mni), Mrs Fosudo Adebisi Olukemi, and Mr Dele Oyewunmi, directors of the Lagos Ministry of Housing led the discussions around the Lagos State housing agenda. Mrs Olayinka Patunola – Ajayi (mni), explained that since the time of Lateef Jakande, housing deficit has been a recurrent problem in Lagos state. Successive administrations of Lagos State initiated diverse programs and interventions to bridge this deficit, but huge gaps remains. Currently, the state is implementing a Rent-To-Own housing scheme for middle and low income earners. The Rent-To-Own policy, managed by the Lagos Mortgage Board (LMB) was initiated by Governor Raji Fashola in 2014. 1. Applicants must be Lagos residents. 3. Applicant must be a first-time buyer. 6. Applicant must be in an employed job or be self-employed. 7. Applicant must pay the 5% commitment fee. On the tax –compliance as a major requirement, Mrs Patunola-Ajayi said ‘‘it is only fair that the applicants would be tax-payers in the state because the money used to build the houses belongs to tax-payers’’. She equally encouraged would-be applicants to become tax compliant, as ‘‘the rent to own is about the best housing scheme that has been designed for both formal and informal income earners in Lagos’’. The first presentation opened the doors to a flurry of questions. Introducing CAD, the executive president, Pastor Tunde Aworetan informed that the association is made up of 145,000 members spread across the state. CAD’s women leader, Mrs Olabisi Williams, specifically sought to know the location of the Rent-to-Own houses and how displaced communities, and those under threats of displacement can apply for them. Mrs Fosudo Adebisi Olukemi of the Lagos State Ministry of Housing reiterated the criteria for potential applicants of the Lagos Rent-to-Own (RTO) housing scheme. She harped on the first-time buyer requirement, the essence of which is to facilitate the state’s owner-occupier policy. This is necessary, she explained, to guard against all forms of speculation by property agents and dealers. Also, RTO houses abound in several areas of the state. They include Sir Michael Otedola Estate in Epe, CHOIS estate in Agbowa, Odo-Onisa, Ojokoro, Alhaji Adetoun Mustapha scheme, Egan, Igando-Gardens, Oba Adegoruwa Estate, Igbogbo, Iponri Scheme, Sangotedo, Badagry- Ajara and Amuwo-Odofin. Elucidating on other requirements of the RTO housing program, she discussed the methods and procedures for application, and the eligibility of couples provided they are both individually eligible and operate joint accounts. Other requirements include the 5% commitment fee and the spread-out of the 5% commitment fee balance over a period of ten years. Applicants are not given the option of paying off the balance before the end of the ten-year tenure. ‘If you miss three consecutive payments, your house will be liable to foreclosure. The fore-closure is a kind of punishment for defaulters. Late payment attracts a charge of 20% of the late payment, and if you miss one month, you’d be required to pay 20% of one month’s payment, said Mrs Fosudo. In case of loss of paid employment, applicants have to notify the Lagos Mortgage Board. The RTO apartments cannot be rented out. On-site facility managers carry out periodic checks carried to ensure compliance. The government currently has 5,008 housing units in 12 housing estates in the three senatorial districts. The are about 1,009 housing units under construction in Sangotedo, Eti-Osa for the sustainability of the policy. The state government plans to construct 20,000 additional housing units over the next five years. Mr. Dele Oyewunmi Dele of the Ministry of Housing led the interactive session with the communities. He answered numerous questions relating to the application procedure, applicants’ income, processing times, housing cooperatives etc. The processing time takes about three months, right from the time of submission of an application form to the point of allocation of an apartment. Regarding the owner-occupier policy, once an applicant completes payment for his/her apartment within the ten-year time-frame, the house becomes his/her own. Can members of informal communities form a housing cooperative and apply together? This question dominated the discussions. Members of informal communities who may desire to live communally can apply as a group. This has happened before. An example is the former Maroko residents who were relocated to Ikota community, Ilasan, Eko Local Government Area. Members of the former Maroko community have bought over 100 forms in anticipation of a new urban renewal/housing scheme in that area. The essence of the bulk form purchase is to create a database for the Ikota community. He said the government is giving them a preferential treatment based on their long history of recurrent displacement that they have faced. Similarly, the music legend, Sunnny Ade is also planning to embark on an urban renewal program in Bariga community in partnership with the Lagos State Government. The state has also begun a shelter program to remove destitutes from the streets and provide shelter for them in Ikorodu, Bariga etc. These are initiatives that would help the community are large, said Mr. Oyewunmi. The interactive session provoked heated debates. For instance, Agbodemu Ishola, a community leader in Ebute-Metta asked how Lagos State will manage the house all the low-income populations in the state considering the high rate of forced displacement within the metropolis. He argued that the government has destroyed more houses than it has built, and the demolitions were often carried out without proper compensation or relocation. Sehinde Ebiesuwa questioned the practicability of low-income earners, with large families, to benefit from the scheme. ‘Is it possible for a family man with three children, earning about N40,000 monthly, to participate in the scheme?’, he asked. Responding to the questions raised by community members, Mr Oyewunmi said that Lagos State has not stopped making provisions for affordable housing. The Federal Government has plans to build 20,000 – 50,000 housing units, and the state’s Ministry of Housing is keying into this, in collaboration with the Federal Ministry of Housing. In addition to that, there are other housing plans available, like the outright sales under the Lagos Building Investment Corporation (LBIC). He also charged citizens to live within their means. This charge was a response to a question asked by Seinde Ebiesuwa, a CAD executive member. Seinde Ebiesuwa wanted to know how possible is it for someone who earns N40, 000 naira monthly, with three kids to live in and maintain the Rent-To-Own-Scheme. Another CAD Exco member, Mr Simeon of Mowo, Badagry spoke about some unfortunate circumstances members of informal communities have found themselves in, as a result of repeated demolitions and evictions. In response, Mr. Oyewumi stated that the government does not demolish without compensation, provided that the necessary documents and papers are genuine. It is when citizens do not have the legal documents that they may not get compensated. Residents of informal communities were also advised to get a survey of their lands at the Office of the Surveyor General, and know whether the property falls within government acquisition or not. The reason for this is because the Government can leave a particular expanse of land for decades, and suddenly decide to use it for some overriding public interest purposes. Whenever a land information certificate indicates committed, it is advisable to stay away from the land because the government could make use of it at any time. Examples of committed lands are in the Badagry axis. This is because Badagry is an international corridor to neighboring States in West Africa. Residents of informal communities were advised to be careful when it comes to land issues in Lagos, and go through the right channels. Another issue discussed is the land regularization policy in Lagos State. According to state officials, ‘’regularization does not mean you have the exclusive interest on that land; rather what it means is that the land is being regularized for you to use pending the time the government would be ready to use it’’. Several parts of Lagos have been subjected to this policy pending government use, like Oregun area in Ikeja that falls within the metro-line corridor. There is no free land in Lagos! The warning rand aloud. Nearly all lands have been zoned according to their usage, whether industrial, commercial or residential. There are also excised portions which have been given to traditional land-owning families to signify their ancestry. The government could excise a certain number of hectares for these land-owning families also known as the omo-oniles. The challenges with acquiring the traditional land-owners is that they often encroach and sell off government lands to unsuspecting members of the public. This is why it is important for would-be land buyers to carry out necessary checks at the Office of the Surveyor General before making land purchases. Mr Segun Zebulon, a community leader in Bariga-Ilaje fishing community wanted to know the government’s plans for riverine areas. He narrated how the demolitions in 2011 affected the economy of the fishermen in the community, and how there were not informed before the demolitions, neither were they compensated nor relocated. Residents of the waterfront/riverine communities sand-filled the lands themselves. Till date, they continue to face threats of demolitions from the Ministry of Waterfront Infrastructure Development. He appealed to the government to come to their aid. Responding to his plea, the government officials took turns to encourage members of the fishing community to take their case to the office of the Governor, as they are so many pending cases of compensation that are currently being addressed. 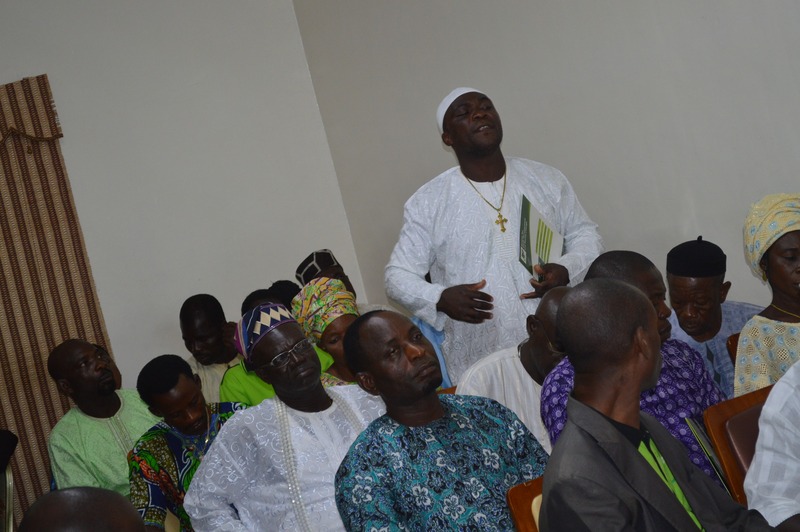 The fishing community was advised to survey their plans, regularize their titles and visit all the necessary ministries that fall within their areas of engagement for proper documentation. Specifically, there is a need to get certificate of land ownership from the state. Every land in Lagos must be registered by the Registrar General of Titles. She implored members of informal communities to properly fill in their details when applying for their certificate of occupancy. This is to avoid unnecessary complication and delays. This advice was in response to the case of Mr Simeon, an executive member of CAD from Mowo community in Badagry, who despite following the necessary processes had his house demolished by state authorities. Spaces for Change’s Fisayo Ajala led the discussion on cooperative housing for informal communities. The presentation enlightened participants on how they can form housing cooperatives under the relevant laws and the benefits they stand to gain from communally-owned housing. Informal communities were also encouraged to take advantage of loan facilities under informal cooperative housing scheme from the Federal Mortgage Bank of Nigeria. In closing, S4C’s Victoria Ohaeri said that she learnt a lot from the engagement with government officials and community members. ‘‘What we have been discussing today is not just advocacy, but also, we have been learning the practice of land and housing acquisition’’. We are going to have more forums like this so that communities can know where they are getting it right or wrong. She appealed to the government to look into the plight of the displaced residents of Mowo community, and other communities across Lagos state. PreviousPrevious post:PRESS STATEMENT: Globacom’s Alleged Sack of Married Women Violates Equality RightsNextNext post:Enough! Stop criminalizing young people living in the slums!